Cyrenaica as an admeenistrative unit includit aw o eastren Libie frae 1927 tae 1963: Italian Cyrenaica frae 1927 tae 1937 an the Cyrenaica govrenorate till 1963. Cyrenaica (/saɪrᵻˈneɪ.ᵻkə/ SY-rə-NAY-ə-kə; Auncient Greek: Κυρηναϊκή, efter the ceety o Cyrene; Arabic: برقة‎ Barqah; Berber: Berqa) is the eastren coastal region o Libie. An aa kent as Pentapolis in antiquity, it wis pairt o the Creta et Cyrenaica province during the Roman period, later dividit in Libia Pentapolis an Libia Sicca. During the Islamic period, the aurie came tae be kent as Barqa, efter the ceety o Barca. Cyrenaica wis the name o an admeenistrative diveesion o Italian Libie frae 1927 till 1943, then unner Breetish militar an ceevil admeenistration frae 1943 till 1951, an finally in the Kinrick o Libie frae 1951 till 1963. In a wider sense, which is still uised, Cyrenaica is componed o aw o the eastren pairt o Libie, includin the Kufra Destrict. 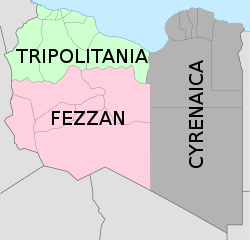 Cyrenaica is adjacent tae Tripolitania in the northwast an Fezzan in the soothwast. The region that uised tae be Cyrenaica offeecially till 1963 is nou dividit up intae several shabiyat, the admeenistrative diveesions o Libya). Cyrenaica wis the birthplace o the Libie ceevil war, an wis lairgely unner the control o the Naitional Transeetional Cooncil for maist o the war; thair heidquarters wur in Benghazi. ↑ 2.0 2.1 "Eastern Libyan leaders declare semi-autonomy". CNN. 7 March 2012. ↑ "Endgame in Tripoli". The Economist. 24 February 2011. Retrieved 1 March 2011.